Take an Advent break and choose from over 30 properties of all types. No reservation fees. 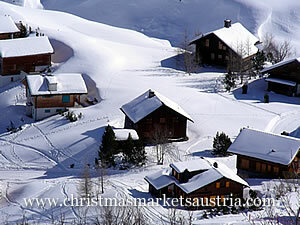 The Vorarlberg may not possess the famous towns and cities of the bigger Austrian provinces to the east, but the major settlements in the province are all enoyable destinations for a short visit - and most of them boast a local Advent Market. Bregenz is the best-known town, the provincial capital situated on the shores of Lake Constance and famous for its summer music festival. Dornbirn is the largest town in Vorarlberg but, despite its size, it does have an attractive central pedestrian area where the Christmas market is held. Feldkirch is probably the prettiest of the three, an old medieval town with a cobbled pedestrian area at the heart of it which is where the seasonal market is held. 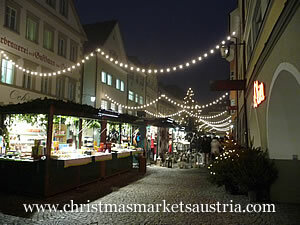 Bregenz has two Christmas markets. The main one is along the principal shopping street in the lower town and includes stalls, an icerink and pony rides for children. The Dornbirn Christmas Market stretches over several streets in the centre of the town around the church of St Martin. Most of the activity is in front of the church on Marktstrasse with an ice rink and the gastronomy stands, but there is also a handicrafts market hidden away around the side of the church. The Feldkirch Advent Market is probably the most photogenic of the Vorarlberg events as it is held in the heart of the historic inner town with stalls and stands on both sides of the Marktgasse. Take in the lake. Bregenz, the provincial capital, is situated on the shores of Lake Constance (or the Bodensee, as it is referred to in German) and there are numerous ferry services which offer trips to other towns on the lake either in Germany or in Switzerland. Alternatively it is possible just to do a short tour out onto the lake from Bregenz in the direction of Lindau and then back around to get a view of the city from the water. Try some local ski resorts. The ski resorts of the Vorarlberg may not be as well-known or as developed as their Tyrolean counterparts, but the province can still boast some good resorts with a nice village atmosphere and with pre-Xmas skiing available in the Bregenzerwald, the Montafon or the Brandnertal. And, of course, one of Austria's most prestigious resorts is still - just - in the Vorarlberg although the trip up to Lech is a long way from the three towns mentioned above. Visit one of the smallest countries in the world. The principality of Liechtenstein is under 20km from Feldkirch. The capital Vaduz, with the castle and official residence of the ruling family perched above the old town, is an interesting day trip, while those with their own transport might want to take a ski trip to the country's only ski resort in Malbun. The Vorarlberg is surrounded by a variety of airports, from the cheap flights into the small regional hub of Friedrichshafen to the international connections available at Zurich. Zurich Airport is probably the most convenient of the airports, with scheduled arrivals from all over the world and good public transport and road connections to the Austrian towns. The airport is located to the north of the city and has a train station underneath the airport. The airport is around 120km from Bregenz. Innsbruck Airport is a little bit further away (180km) in the neighbouring province of the Tyrol. The airport is located to the west of the city centre just off the main motorway heading towards the Arlberg Tunnel and the Vorarlberg. Airport buses travel regularly to the main train station which has good services to all of the main Vorarlberg centres. Friedrichshafen Airport (now also known as Bodensee Airport) is a very small German regional airport which is the closest to the Vorarlberg towns but is hindered by a lack of choice in flight arrivals. Public transport is available via local rail services while the road network eventually joins onto the motorway north of Bregenz. The best public transport connections between the towns of the Vorarlberg are by the excellent and frequent local train services which run between the towns mentioned above.